Scrumptious pasta bake…with all the flavors of Italy! Cook the pasta to al dente, about 7 minutes. Drain and add to 9x13-inch baking dish. In a large saucepan, brown the ground beef with the minced onion, garlic powder, salt, and pepper. Drain and gently toss with the pasta in the baking dish. In a large mixing bowl, combine cottage cheese, half of the shredded mozzarella cheese, all of the Parmesan cheese, egg, and Italian seasoning. Spread the cheese mixture in and around the pasta in the baking dish. Top with spaghetti sauce and add the remaining shredded mozzarella cheese over the top. 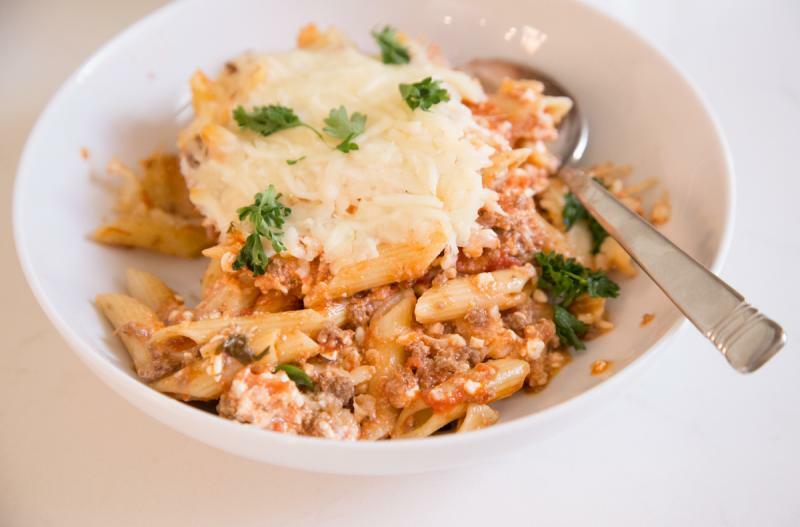 Serve Penne Rigate Bake with salad. Brown 2 lbs. ground beef, 2 Tbsp minced onion, 2 tsp garlic powder, and salt and pepper to taste. Drain and let cool. Cook 2 boxes of pasta to al dente, about 7 minutes. Drain and evenly divide between the trays. In a large mixing bowl, combine 2 - 8 oz. containers cottage cheese, 2 cups of the shredded mozzarella cheese, 2 cups Parmesan cheese, 2 eggs, and 2 Tbsp Italian seasoning. Thaw completely and bake covered at 400 F for 45 minutes. Then uncover and bake another 10 minutes.